A Kid-Powered pet with springs in to his step that is sure to turn heads! Interacts, walks, runs with children just like a real pet! 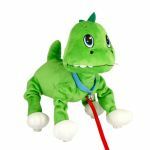 Includes: Collar with Bell and Leash, Spring Action Head and Legs, Natural and Fun walking action.